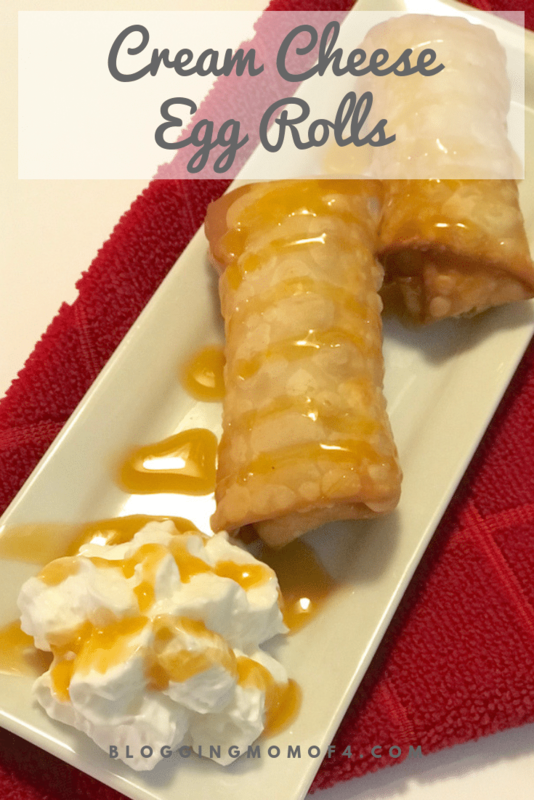 Easy Cream Cheese Egg Rolls - Try with a variety of toppings! So after we made our Thanksgiving Egg Rolls, we decided to keep experimenting. We didn’t have any desert leftover from Thanksgiving (shocking right?! 😉 ) so we made ourselves some Cream Cheese Egg Rolls. These are so easy to make, delicious, and good any time of the year!! First, I just made up the cream cheese filling. Super easy. I always have cream cheese on hand and happened to have sour cream. There’s several varieties of cream cheese filling out there but the one I made uses cream cheese, sour cream, sugar, vanilla, and a pinch of salt. In a medium bowl, combine cream cheese with sugar, sour cream, vanilla, and salt with a hand mixer until fully combined. Once you have the filling ready, pour 1″ of vegetable oil in a good pan and heat to 350. I used the Copper Chef Fry Pan. I suggest using a food thermometer to try to keep it as close to 350 as you can. Too hot and you’ll burn your cream cheese egg rolls, too cool and they’ll take a lot longer to be done. Right at 350, they were a beautiful light brown. Now you’re ready to assemble. First, place an egg roll wrapper in a diamond shape on your work surface and spoon 2-3 tablespoons cream cheese mixture on the wrapper. Add cream cheese egg rolls to your heated oil and fry until golden. Typically 1-2 minutes per side. Carefully transfer to a paper towel-lined plate and cool. These are amazing served warm or even cooled. (That’s if they even make it to the refrigerator before the family eats them all. 😉 ). 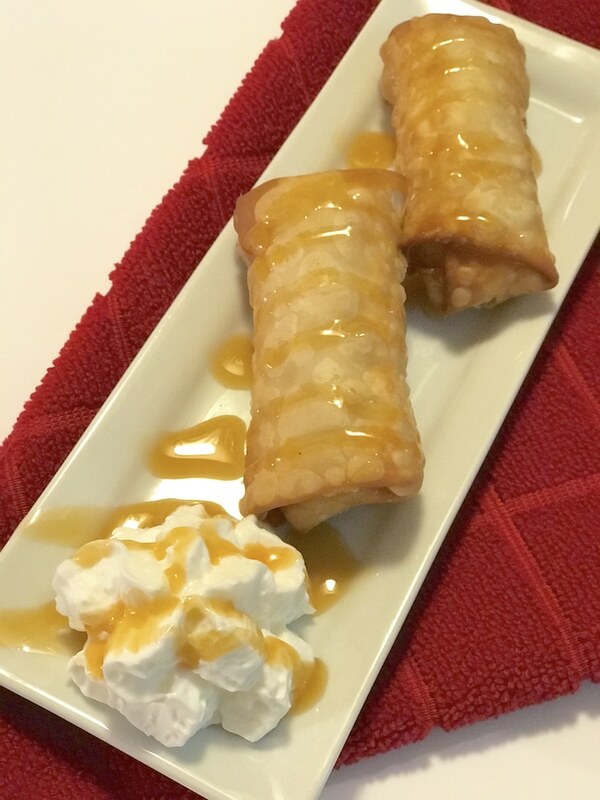 We chose to drizzle a little caramel over the top with a little whip cream. So delicious. Aren’t they beautiful? Mmm and so good! I imagine these would be good with a variety of toppings. Whatever you have on hand or plan ahead and pick up chocolate sauce or any of your favorite pie fillings like strawberry, cherry, blueberry, etc. We are really loving the versatility of egg roll wrappers. So easy to prepare and delicious. Ooooh I just had a fantastic thought… pumpkin pie filling! Oh my! Might have to try those next. 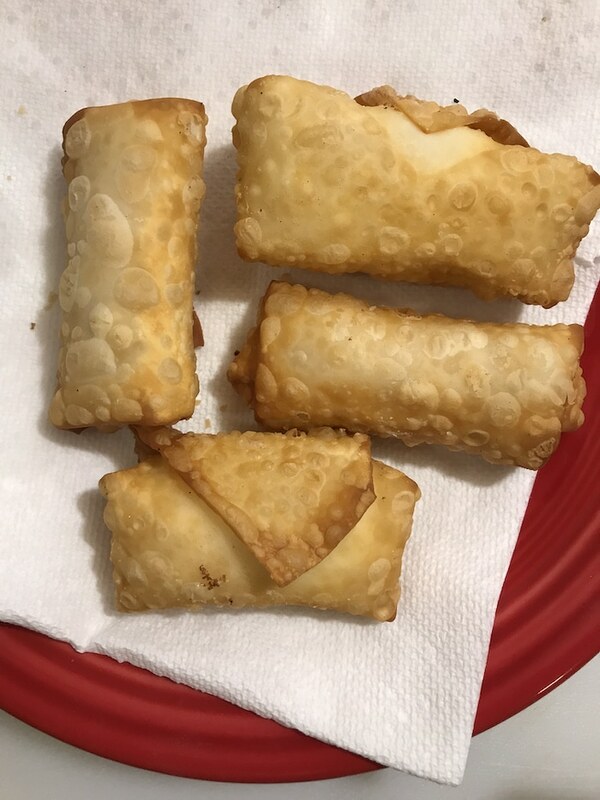 Let me know what other egg roll wrapper ideas you have and if you try these Cream Cheese Egg Rolls. This recipe seems tasty, different and fun to try! Looks great. I’d love to try this. I don’t often fry food, so this would be new for me. That’s what we thought too. 🙂 Just a bit sweeter than crab rangoon but still delicious. Wow!!! These look amazing! Wonder if my picky eaters will try them! Thanks for posting! This sounds so delicious! I have to try to make these. This recipe seems easy to follow. The egg rolls look delicious. Looks tasty. I should try the recipe with other fillings, too! Let me know what fillings you try! These look delicious and easy to make. I would love to try with an apple pie filling and caramel sauce on the top. Oh my goodness, yes! That sounds delicious!